One positive event to emerge from the dreadful Grenfell Tower tragedy in West London has been the birth of the Hubb Community Kitchen. It was started by a group of women who had been displaced by the fire, and needed somewhere to cook fresh food for their families. They began to use the kitchen at the nearby Al-Manaar Muslim Cultural Heritage Centre, sharing the space for two days a week, swapping recipes, often handed down through the generations, from the Middle East, North Africa, Europe and the Eastern Mediterranean. Fifty of these recipes have now been collected in a book, Together: Our Community Cookbook – green chilli and avocado dip, Persian chicken, aubergine masala, spiced mint tea – all photographed by Jenny Zarins and providing a unique glimpse into the culinary heritage of the many different cultures that share this part of West London. Two of the recipes appear below. 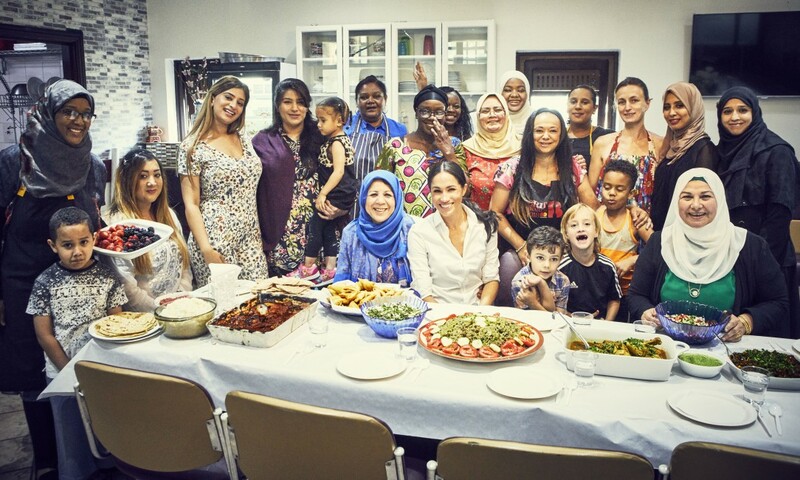 In an unexpected twist, the book turns out to have been the idea of Meghan Markle, herself a resident of West Kensington, who was an early visitor to the Hubb Kitchen and has spent some time cooking (aka peeling potatoes) with the women who volunteer there. through. Set aside. In the same pan, fry the onion slices and green pepper in about 2 tablespoons of the oil for about 5 minutes, until just golden. Add the remaining garlic and fry for 1 more minute. Set aside. In a measuring jug, mix the water with the tomato puree, tamarind paste and sugar until well blended. Arrange half of the aubergine, potato, onion, pepper, tomatoes and meatballs in a 30cm round baking dish, overlapping them. Season well, then pour half of the tomato sauce over the top. Repeat with the rest of the vegetables and meatballs. Season well and pour the remaining sauce on top. Cover with foil or a lid and bake for 30 minutes, then uncover and bake for another 20 minutes. Serve with basmati rice or bread to mop up the sauce.